Hadeeth Qudsi are the sayings of the Prophet Muhammad (Peace and Blessings of Allah be upon him) as revealed to him by the Almighty Allah. Hadeeth Qudsi (or Sacred Hadeeth) are so named because, unlike the majority of Hadeeth which are Prophetic Hadeeth, their authority (Sanad) is traced back not to the Prophet but to the Almighty. Among the many definitions given by the early scholars to Sacred Hadeeth is that of as-Sayyid ash-Sharif al-Jurjani (died in 816 A.H.) in his lexicon At-Tarifat where he says: "A Sacred Hadeeth is, as to the meaning, from Allah the Almighty; as to the wording, it is from the messenger of Allah . It is that which Allah the Almighty has communicated to His Prophet through revelation or in dream, and he, peace be upon him, has communicated it in his own words. Thus Qur'an is superior to it because, besides being revealed, it is His wording." 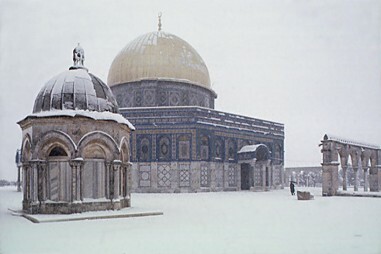 (2) The pre-Islamic Arabs believed that rain was brought about by the movement of stars. This Hadeeth draws attention to the fact that whatever be the direct cause of such natural phenomena as rain, it is Allah the Almighty who is the Disposer of all things. Surat al-Fatihah, the first surah (chapter) of the Qur'an. i.e. standing behind the imam (leader) listening to him reciting al-Fatihah. "Praise be to Allah, Lord of the Worlds." "Master of the Day of Judgement". "It is You we worship and it is You we ask for help". "Guide us to the straight path, the path of those upon whom You have bestowed favors, not of those against whom You are angry, nor of those who are astray". (1) i.e. at the time of the Hour. It was related by Abu Dawud (also by Ibn Majah and Ahmad) with sound chains of authority. This Hadeeth also appears in Muslim in another version. i.e. a man who has made a slave of another and has sold him. Truly of those devoted to Me the one I most favour is a believer who is of meagre means and much given to prayer, who has been particular in the worship of his Lord and has obeyed Him inwardly (1), who was obscure among people and not pointed our, and whose sustenance was just sufficient to provide for him yet he bore this patiently. Then the Prophet rapped his hand and said: Death will have come early to him, his mourners will have been few, his estate scant i.e. he has not been ostentatious in his obedience. We asked Abdullah (i.e. Ibn Masud) about this verse: And do not regard those who have been killed in the cause of Allah as dead, rather are they alive with their Lord, being provided for (Quran Chapter 3 Verse 169). He said: We asked about that and the Prophet said: Their souls are in the insides of green birds having lanterns suspended from the Throne, roaming freely in Paradise where they please, then taking shelter in those lanterns. So their Lord cast a glance at them (1) and said: Do you wish for anything? They said: What shall we wish for when we roam freely in Paradise where we please? And thus did He do to them three times. When they say that they would not be spared from being asked [again], they said: O Lord, we would like for You to put back our souls into our bodies so that we might fight for Your sake once again. And when He saw that they were not in need of anything they were let be i.e. at those who had been killed in the cause of Allah. If My servant likes to meet Me, I like to meet him; and if he dislikes to meet Me, I dislike to meet him. Prophetic explanation of this Sacred Hadeeth: He who likes to meet Allah, Allah likes to meet him; and he who dislikes to meet Allah, Allah dislikes to meet him. Aishah (may Allah be pleased with her) said: O Prophet of Allah, is it because of the dislike of death, for all of us dislike death? The Prophet said: It is not so, but rather it is that when the believer is given news of Allah's mercy, His approval and His Paradise, he likes to meet Allah and Allah likes to meet him; but when the unbeliever is given news of Allah's punishment and His displeasure, he dislikes to meet Allah and Allah dislikes to meet him. (1) A similar Hadeeth, which is given by Abu Dawud, indicates that the person referred to was a goldly man whose previous good deeds were brought to nought through presuming to declare that Allah would not forgive someone's bad deeds. When Allah created Paradise and Hell-fire, He sent Gabriel to Paradise, saying: Look at it and at what I have prepared therein for its inhabitants. The Prophet said: So he came to it and looked at it and at what Allah had prepared therein for its inhabitants. The Prophet said: So he returned to Him and said: By your glory, no one hears of it without entering it. So He ordered that it be encompassed by forms of hardship, and He said: Return to it and look at what I have prepared therein for its inhabitants. The Prophet said: So he returned to it and found that it was encompassed by forms of hardship (1). Then he returned to Him and said: By Your glory, I fear that no one will enter it. He said: Go to Hell-fire and look at it and what I have prepared therein for its inhabitants, and he fount that it was in layers, one above the other. Then he returned to Him and said: By Your glory, no one who hears of it will enter it. So He ordered that it be encompassed by lusts. Then He said: Return to it. And he returned to it and said: By Your glory, I am frightened that no one will escape from entering it. It was related by Tirmidhi, who said that it was a good and sound Hadeeth (also by Abu Dawud and an-Nasa'i).